This chapter explains verification and common configuration procedures for the WebFOCUS Client. Because the architecture of WebFOCUS Portals and Favorites has changed in WebFOCUS Release 8.1, Portals and Favorites must be converted for use in the new architecture. If the Portals and Favorites were not automatically converted during the upgrade process, you can run the conversion utilities manually. The WebFOCUS Repository must be running to perform the conversion. Note: If you are upgrading from an earlier version of WebFOCUS Release 8.1, you do not need to convert Portals, only Favorites. Enter a WebFOCUS administrator ID and password. Select 1 to select WebFOCUS 77x. This is the default option. Select 2 to select WebFOCUS 8x. Select q to exit the conversion utility. When the utility has completed the conversion, it will notify you. Press Enter to exit. The log for the conversion is stored in inst_dir\ibi\WebFOCUS80\migration_import\export. The file name is bip_favorites_migration.log. Note: This step must also be performed if you are migrating Favorites from WebFOCUS Release 8.1 Version 00 to WebFOCUS Release 8.1 Version 03 or higher. Note: If you have upgraded from WebFOCUS Release 8.1 Version 00 to a later version of Release 8.1, the location will be inst_dir/ibi/WebFOCUS81/utilities/bip instead. The log for the conversion is stored in inst_dir\ibi\WebFOCUS80\migration_import\export. The file name is bip_portal_conversion.log. Note: If you have upgraded from WebFOCUS Release 8.1 Version 00 to a later version of Release 8.1, the location will be inst_dir/ibi/WebFOCUS81/migration_import/export instead. In a split web-tier environment, all WebFOCUS web components run through the application server, and you should not create the ibi_html and approot aliases on a web server. Instead, you can configure your application server to serve the content in the install_directory/ibi/apps directory. The steps for configuring WebFOCUS to run only in an application server configuration is similar to split web-tier, in that you configure the application server to serve static content from the ibi_html and apps directories. This is described in Using the Static Content Server Option. The one difference is where the ReportCaster Default Library URL is pointing. With split web-tier, this setting points to the web server. In an application server-only configuration, it points to the application server. approot.war. Serves content from the install_directory/ibi/apps directory. ibi_html.war. Serves content from the install_directory/ibi/WebFOCUS81/ibi_html directory. The web server is unable to access the static content because it is located on the application server machine. There is no web server and you wish to use an application server by itself. Note: Tomcat can be used by itself without these applications because it can map a directory on the file system to a context path. Each application includes a deployment descriptor (webconfig.xml) that is used to locate the directory containing its configuration file. The context parameter IBI_Configuration_Directory in webconfig.xml is updated during installation to point to install_directory/ibi/WebFOCUS81/config, which contains the configuration file approotConfig.xml. The configuration file is shared by both content server applications even though its name suggests it would be used by only one. The configuration file is used to maintain MIME mappings, the physical path of the directories being served, and the logging level. The applications also include a Log4J property file (log4j.xml), which contains the path to the log file used by each application. The installation updates each log4j.xml file with the path to its own log file, install_directory/ibi/WebFOCUS81/logs/wfapproot.log and install_directory/ibi/WebFOCUS81/logs/wfibihtml.log, respectively. The content server applications roll the log files over daily by appending the date to the log file and creating a new one (for example, wfibihtml.log.2014-01-01). You can increase the log level by editing install_directory/ibi/WebFOCUS81/config/approotConfig.xml and changing the log level setting to DEBUG, INFO, WARN, ERROR, or FATAL, where DEBUG is the most verbose. There are special considerations for using the content server option in a clustered web-tier environment. Generally speaking, the approach of specifying a fully qualified path to the configuration file (approotConfig.xml) in webconfig.xml and of specifying a fully qualified path to the log files in log4j.xml is sufficient for most installations. These paths are properly set during installation. Edit the WebFOCUS webconfig.xml file found inside both the approot.war and ibi_html.war files. Replace the fully qualified path defined in the IBI_Configuration_Directory parameter with the notation shown below. Add the following –D options in the manner appropriate for the Java VM for your application server. The settings below are slightly different in a clustered web-tier environment. To configure the WebFOCUS Client, edit files either through a text editor or the WebFOCUS Administration Console. The WebFOCUS Administration Console also provides tools to verify the installation. For NLS configuration information, see the WebFOCUS Security and Administration manual. WebFOCUS 8 contains a Welcome page in the WebFOCUS BI Portal from which you can access WebFOCUS interfaces, such as the WebFOCUS Administration Console. Ensure that the web or application servers are started and configured. Are the host name and HTTP port of the web server or application server. If you require SSL, use https instead of http. The WebFOCUS Sign In page opens, as shown in the following image. Note: If you receive a page not found error, ensure that your application server is started and that you have deployed the WebFOCUS application. For more information on configuring your application server, see Installing the WebFOCUS Client. Note: If you receive an invalid user name or password error, ensure that the WebFOCUS repository has been created and contains initial table data. The WebFOCUS BI Portal page displays, as shown in the following image. You can change the default credentials using the Security Center facility. Click Administration from the top menu, and then Security Center. For more information, see the WebFOCUS Security and Administration manual. You can access the WebFOCUS Administration Console from the WebFOCUS Welcome page, or you can access the WebFOCUS Administration Console directly from the browser by supplying its URL. Access the WebFOCUS Administration Console using Internet Explorer or Firefox. Ensure that the web server and application server are started and configured. Sign in to the WebFOCUS Welcome page, then click Administration from the top menu and select Administration Console, as shown in the following image. If a sign-in page does not appear, ensure that your web server and application server are started and configured. Sign in using an administrator user ID. By default, admin is a valid administrator ID, and the password is admin. Note: After you have verified the WebFOCUS Client configuration, change the password of the default administrator user ID, which is admin. For more information on WebFOCUS Client security, see the WebFOCUS Security and Administration manual. The WebFOCUS Administration Console opens, as shown in the following image. Using this console, you can edit the WebFOCUS Client communication and security settings. This console is documented in the WebFOCUS Security and Administration manual and relevant sections are available by clicking Help. The WebFOCUS Administration Console contains a verification tool to further test the configuration. On the left pane of the WebFOCUS Administration Console, click Diagnostics. Below Verification, click WebFOCUS Client. Review the test results and troubleshoot accordingly. For troubleshooting assistance, see Troubleshooting WebFOCUS and ReportCaster. It is a good idea to set authentication for the WebFOCUS Administration Console. The WebFOCUS Administration Console does not have its own authentication mechanism and by default, none is used. If you wish to set authentication for the console, you can choose to do this through the WebFOCUS Reporting Server or the web server. For more information, see the WebFOCUS Security and Administration manual. This file contains node blocks defining WebFOCUS Reporting Servers that the client accesses. A node block is a set of parameters that define a server, listener, or other communication component. When you installed the WebFOCUS Client, you specified a default WebFOCUS Reporting Server that the client accesses. If this is the only server the client will access, you can proceed to Configuring Static Authentication. To change connection information for the default server or define additional servers, use the procedures that follow. On the left pane of the WebFOCUS Administration Console, click Reporting Servers. Under Reporting Servers, click Remote Services. The right pane displays all defined WebFOCUS Reporting Servers. To edit parameters of a defined WebFOCUS Reporting Server, select its radio button and click Modify. To define an additional node, click New. Enter a unique name for the new NODE. Use this name when you wish to access the server. This page lets you choose to define a single server (Client), CLM Processing, or a Cluster node. A cluster node is a node that consists of multiple servers. When the client accesses the cluster, it chooses one of the servers in that cluster. This is used for load balancing and fail over. The best way to use clusters is through the Cluster Manager component that you can optionally add to your WebFOCUS environment. Complete the HOST and PORT fields. The remaining fields are optional in most environments. Note: Setting the User ID and Password here is not recommended and may not have the desired result. On the top of the page, click Clear Cache so your changes take effect. On the left pane of the WebFOCUS Administration Console, under Configuration, click Client Settings and then click Reporting Server. In the IBI_REPORT_SERVER field, type the node name of the default server. Click Save on the bottom of the page. On the top of the page, click Clear Cache. When the client accesses a WebFOCUS Reporting Server running with security, the client must sign in to the server for tasks, such as browsing metadata, listing files, or running reports. Either your applications or users can provide credentials, or you can use Static Authentication. With Static Authentication, you specify a user ID and password that the client always passes to the server. This can be set for all servers or for each individual server. Static authentication ensures that every WebFOCUS Client connection to a server accesses the server using the same environment configuration. Note: In some environments, you may be able to use Trusted Authentication (Already Verified Processing) instead of Static Authentication. For more information, see the WebFOCUS Security and Administration manual. This section only addresses static authentication. You should set these variables using the WebFOCUS Administration Console so you can encrypt the file containing your password. Static authentication is defined globally for all nodes in the cgivars.wfs file. Static authentication can be defined for a specific node by creating a profile with the node name. These steps set sign-in credentials that are used when accessing all servers. On the left pane of the WebFOCUS Administration Console, click Configuration. Under Client Settings, click Reporting Server. Provide the credentials to use for static authentication in the IBI_REPORT_USER and IBI_REPORT_PASS fields. Select the ENCRYPT checkbox to ensure that the file cannot be read through the file system. This is recommended because the file contains a user ID and password. These steps set sign-in credentials that are used when accessing a specific node (a server or a cluster). The right pane displays defined WebFOCUS Reporting Servers. Select the node for which you are setting authentication, and click Profile. Uncomment one pair of IBI_REPORT_USER and IBI_REPORT_PASS lines, and set them to the account you wish to use. Select the ENCRYPT checkbox to ensure that the credentials cannot be read through the file system. Click Save. A profile for the node is created if it does not already exist. 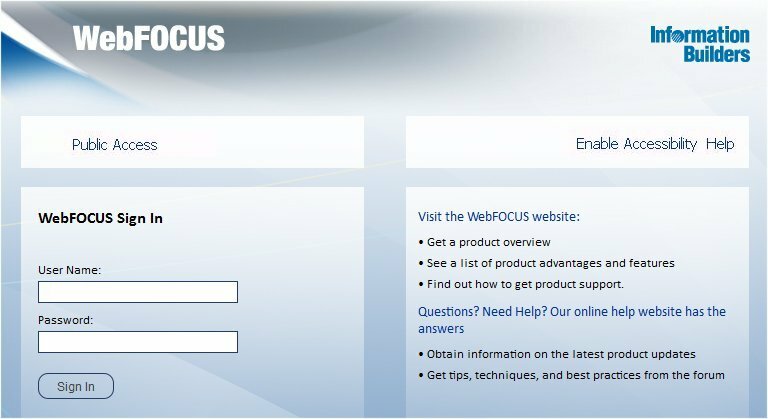 For additional information on using the WebFOCUS Administration Console, click Help or see the WebFOCUS Security and Administration manual. Although most WebFOCUS Client features are configured through the WebFOCUS Administration Console, some features are enabled and configured through the WebFOCUS Reporting Server. If you license Active Technologies, you must provide the Active Technologies license code in the WebFOCUS Reporting Server Web Console. Sign in to the WebFOCUS Reporting Server Web Console. This console was introduced in How to View the Web Console and Test the Server. Right-click the Workspace folder in the navigation pane and select License, or click License on the ribbon. Enter your Active Technologies license in the license_active_report field, and click Save and Restart Server. Active Technologies for Adobe® Flash® is generated using a Java-based compiler engine that is included with Adobe Open Source Flex SDK for the WebFOCUS Reporting Server. There is a known issue with the Adobe Flex® compiler not working properly with the IBM version of Java due to a conflict between the version of Xerces that the Flex software uses and the one that is included with the IBM JVM. As a workaround, ensure that the JVM loads the version of Xerces supplied with the Flex software instead of the version supplied with the IBM JVM. This must be set in the CLASSPATH because the Flex compiler does not read the IBI_CLASSPATH when it is executed. As a default, Apache Tomcat sets the maximum size limit to 2097152 (2MB) limit for accepting HTTP POST requests. Since EXL07 MIME files can easily reach this limit, ExcelServlet will fail with a HTTP 400 error or produce a corrupted .XLSX file. To fix this problem, Tomcat needs to be configured by setting an attribute in the server.xml file. When configuring WebLogic®, you must perform the following post-installation step. Once the file is saved, you must recreate the .war file by adding it to webfocus.war. The .war file can be renamed based on your naming convention, and then redeployed. 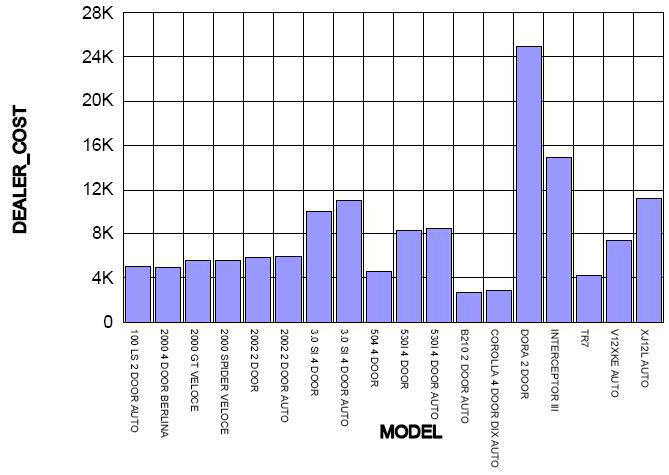 This section explains how to verify and troubleshoot the most common type of graphs. By default, WebFOCUS graphs are generated through the web or application server using a Java-based graph engine installed with WebFOCUS Client. This is known as Server Side Graphics or PCHOLD. Using this approach, a complete graph file is created on the web or application server and then sent to a browser. If an X Windows Server is available, set a DISPLAY variable to the X Windows Server and ensure the X Server accepts the connection. This supports all WebFOCUS graph options. For more information, see How to Use Server Side Graphics by Settings DISPLAY. GIF files are not supported. Graphs must be generated with the new graph engine (GRAPH53). Graphs created in WebFOCUS 5.2 and earlier used the older WebFOCUS graph engine (GRAPH32) which did not support headless. See How to Use Server Side Graphics With the Headless Java Option for more information. If your UNIX machine does not have an X server, you can install an X Server on a Windows machine and set DISPLAY to that Windows machine. The xhost command is installed with your X Windows environment and may not be in your PATH by default. After issuing the xhost command, leave this user logged on so that an X session remains running. To protect the machine, lock the display instead of logging off. If a different user needs to log on to the physical machine or the machine is rebooted, the xhost command should be reissued on log on and an X session left running. Review your application server documentation and see Configuring Web and Application Servers. After setting Java options, completely restart your application server. Note: If you change the default WebFOCUS Graph settings to use SSG_EXTERNAL=YES, then it should also be set through the WebFOCUS Administration Console under Configuration and Graph in the IBIJAVACMD field. A sample procedure is installed with the WebFOCUS Reporting Server to test Server Side Graphics. Sign in to WebFOCUS as an administrator and select Administration from the Administration menu. Expand the Diagnostics node, then the Verification node, and then select WebFOCUS Reporting Server. In the Procedure name field, enter cargraph and click Run. If the server runs with security, log on. Your browser should display a graph similar to the following image. If you get an error or the browser seems to hang, check your application server logs. If you are setting a DISPLAY variable, you may find the following errors in your logs. java.lang.InternalError: Can't connect to X11 window server using ':0.0' as the value of the DISPLAY variable. This means that the DISPLAY variable is probably not set properly. Be sure to set and export this variable to a machine that is running an X server. java.lang.InternalError: Can't connect to X11 window server using 'localhost:0' as the value of the DISPLAY variable. This means that there is no available X Server on the host or the host is rejecting the connection. Try using the xhost command, as explained in How to Use Server Side Graphics by Settings DISPLAY. You must configure your X Server to allow the connection and then restart the application server. Ensure that you are using a JDK of Release 6 or higher. Ensure that the headless option is set for your application server Java VM as explained in Configuring Web and Application Servers. Be sure to restart your application server. If you are planning to use a reverse proxy configuration with an Apache Tomcat application server, you must configure a setting in the server.xml file to ensure that all URL calls use the address of the web-facing proxy server as opposed to the internal server. Is the location on your system where Apache Tomcat is installed. Search for the Coyote/JK2 AJP 1.3 connector block. For the proxyName parameter value, specify the host name of the web-facing proxy server. For the proxyPort parameter value, specify the port number of the web-facing proxy server. Save the changes to the server.xml file. Restart the Apache Tomcat application server.